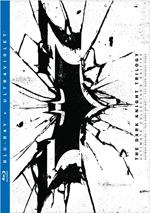 A 2013 Blu-ray package called “The Dark Knight Trilogy: Ultimate Collector’s Edition” gives us a chance to revisit the Batman films Christopher Nolan directed between 2005 and 2012. We get the three movies spread across five discs with additional supplements on a sixth platter. 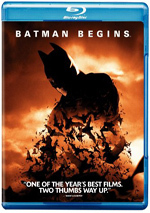 For full information on the individual movies, please consult my separate reviews of 2005’s Batman Begins, 2008’s The Dark Knight and 2012’s The Dark Knight Rises - you’ll find these linked above. Note that the picture and sound grades found at the top of this article represent an average for the three movies. Please check out the full reviews to get the details. As far as I can tell, the UCE discs duplicate the Blu-rays found individually. They get new art but they appear to be identical transfers, so fans who expect changes in picture/sound quality won’t find them. Though this article covers the boxed set as a whole, I want to concentrate mainly on the package’s sixth platter. Called simply “Special Features”, this disc includes a few trilogy related materials. 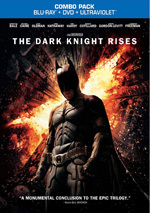 The main attraction comes from The Fire Rises: The Creation and Impact of “The Dark Knight Trilogy”. The documentary runs one hour, 16 minutes, 48 seconds and provides notes from executive producer Michael Uslan, Entertainment Weekly senior writer Jeff Jensen, Variety chief film critic Scott Foundas, writer Damon Lindelof, producers Charles Roven and Emma Thomas, WB Picture Group presiden Jeff Robinov, writer/director Christopher Nolan, WB Pictures President of Production Greg Silverman, film critic Richard Roeper, Batman: Arkham Asylum writer Paul Dini, filmmakers Zack Snyder, Michael Mann and Guillermo del Toro, comedian Chris Hardwick, screenwriters Jonathan Nolan and David Goyer, production designer Nathan Crowley, former DC Comics president/publosher Paul Levitz, Batman comics writer/editor Dennis O’Neil, co-producer Jordan Goldberg, DC Comics COO Geoff Johns, casting director John Papsidera, costume designer Lindy Hemming, WB EVP Creative Advertising Massey Rafani, and WB Worldwide Marketing president Sue Kroll. “Fire” looks at the reboot of the franchise and how Nolan came to the series, what the director brought to the project, story/character areas and the approach to the material, themes and influences. We also hear about vehicle, costume and set design, cast and performances, various effects, stunts and action, advertising and promotion. With more than an hour and a quarter at its disposal, one would expect a good look at the Trilogy here – and one gets that, though it doesn’t seem as strong as I hoped. I looked forward to a sweeping, all-inclusive take on the series and that doesn’t really occur. It seems strange that we don’t hear from any of the actors, and even at 76 minutes, we need to move through subjects pretty quickly; that leaves only about 25 minutes per film. The notes we find are quite good, and we locate a lot of nice archival footage as well. That includes some screen tests that are a delight to see, and we even get a “guest star”. Amy Adams plays Rachel in a try-out with Christian Bale; apparently she wasn't up for the role, but she came in as a favor. Along with these fun bits, we also find a lot of praise for the Trilogy – way too much praise, I think. I adore this series so I agree with all the plaudits, but it seems immodest for the program to focus so heavily on happy talk. “Fire” proves to be enjoyable and informative, but it’s not the great documentary I hoped to find. For a confab between Nolan and the director of 1978’s Superman: The Movie, we go to Christopher Nolan and Richard Donner: A Conversation. In this 25-minute, 11-second piece, they discuss various aspects of their respective films and compare notes. We don’t get a ton of fresh information, but it’s fun to see the two talk about their experiences in this face-to-face encounter. Also on the bonus disc, we get IMAX Sequences. These show the scenes shot with IMAX cameras for The Dark Knight (6 segments, 36:56) and The Dark Knight Rises (15, 70:33). Don’t expect all one hour, seven minutes and 29 seconds to offer IMAX shots. Instead, the elements cut from the roughly 1.44:1 IMAX dimensions to the 2.40:1 featured in the rest of the film. Most of it’s IMAX, but shifts do occur, and they occasionally seem a bit jarring, as we’ll go from a quick IMAX shot back to 2.40:1 without much time to absorb the ratio shift. How did the presentation work at an IMAX theater? The IMAX-specific shots filled the squarish screen, so the 2.40:1 elements – which meant most of the movies – were letterboxed. Just like watching a widescreen movie on a 4X3 TV, black bars filled the space above and below the footage. This sounds distracting, but despite the occasional jarring jumps, the variations usually flowed well. I thought the ratio changes would be a mess, but they moved pretty smoothly, especially in Rises; that film handled the transitions better than Dark Knight did. On the huge screen, the IMAX footage was stunning. It wasn’t just the size of the material; the IMAX bits also looked crisper and more vivid than the standard shots. This left such a strong impression that it made me wish the flicks went IMAX for their entirety. 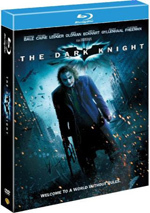 If you read my reviews for the Dark Knight and Rises Blu-rays, you’ll see that the movie discs in this set offer a compromise: when the films come to IMAX footage, the screen expands from 2.40:1 to 1.78:1. This means that we may not get all of the IMAX information, but we come closer than we would if the flicks remained 2.40:1 from start to finish. So why bother to present the IMAX scenes separately on this disc? Because these shots allow us to view the entire original IMAX frame without the cropping that came in the 1.78:1 segments on the movie Blu-rays. That’s a nice concept, but it’s not much fun to actually watch. The disc presents the 2.40:1 shots in the normal manner; they extend to the screen’s sides and feature mild black bars on the top and bottom. For the IMAX shots, the image fills the spaces occupied by black bars for the 2.40:1 elements but becomes pillar-boxed on the sides. So the advantages of the IMAX presentation vanish when viewed at home, as the set-up means that we lose the coolness of the huge visuals. Do the IMAX segments have any point on disc other than for curiosity value? Not especially - it’s fun to be able to see the shots as originally composed, but given that they’re left in isolation, I can’t imagine many fans will choose to watch them this way, especially since the movie discs provide a good aspect ratio compromise. It’s nice to have the full IMAX shots for archival purposes but I can’t imagine I’ll revisit them. If the set had included the entire movies presented this way, I might watch them, but I don’t enjoy seeing bits and pieces of the flicks. A few non-disc-based materials appear as well. A Letter from Christopher Nolan gives us an overview of his experiences. It doesn’t say much but it’s a nice complement to the package. We find three Premium Mattel Hot Wheels Vehicles: the Tumbler, the Batpod and the Bat. I don’t know what makes them “premium”, but they’re kind of cool to have. Next we locate five Collectible Art Cards. Each one shows a different Trilogy villain, and we view artistic interpretations of the characters by someone who calls himself “Jock”. They’re creepy and unusual. Finally, the set finishes with a 48-Page Book. It shows photos and art from the three films. I’d prefer something more substantial with production notes and facts, but we see some quality images here. Does the “Dark Knight” series offer the best trilogy of all-time? Could be. As of 2013, the three films - Batman Begins, The Dark Knight and The Dark Knight Rises - offer the most satisfying trilogy I’ve experienced; at the very least, they form the best super hero franchise committed to film. 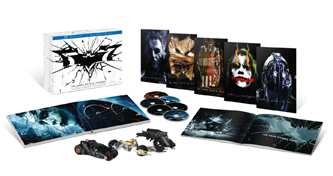 With “The Dark Knight Trilogy: Ultimate Collector’s Edition”, we get all three movies plus new bonus materials. The films look and sound very good to great, and the supplements add a lot of useful information along the way. But is it a “must-have” for fans? Probably not. As one who adores the trilogy, I’m very happy to own it, but I find it difficult to strongly recommend it. The package reissues the three already-released Blu-ray sets and adds some good but not overwhelming new extras. It’s definitely a nice set but it’s just too pricey to recommend to anyone other than super-fans.